New GM Brian Gutekunst wasted no time making his mark on the Packers roster. Signing FA Tight end Jimmy Graham to a three year $30 million deal is a move that signals a sea change for the historically conservative Packers. To facilitate this deal, they also parted ways with long-time Aaron Rodgers favorite Jordy Nelson. What does this mean for the dynasty value of Jimmy Graham, and how will he fit in the Packers offense? One thing is sure, when healthy, Rodgers will continue to be one of the most productive fantasy QBs in the game, although questions remain as to whether Jimmy Graham will be a beneficiary of this. Aaron Rodgers only played in 6-games last season before going down with an injury. Before that, he failed to establish much of a rapport with Martellus Bennett. 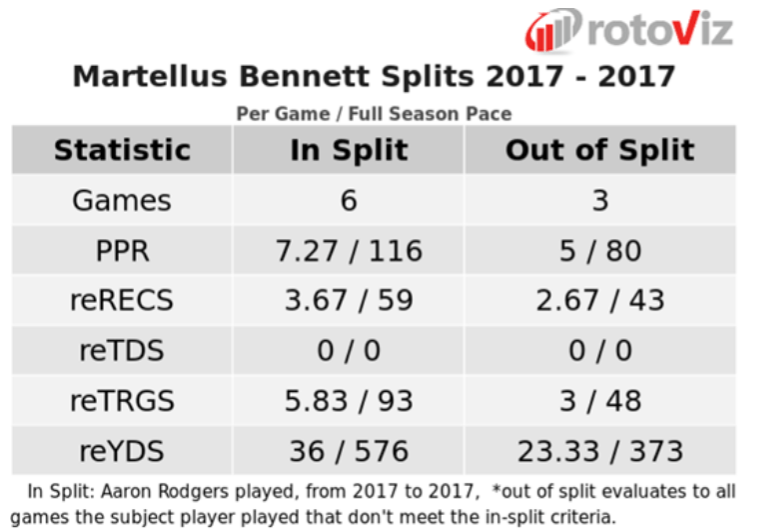 The signing of Bennett was widely lauded and his ADP quickly rose, but using the RotoViz Game Split app we can see that Bennett was not a favorite target of Rodgers. Bennett’s output was even worse when Brett Hundley stepped in following Rodgers’ injury. 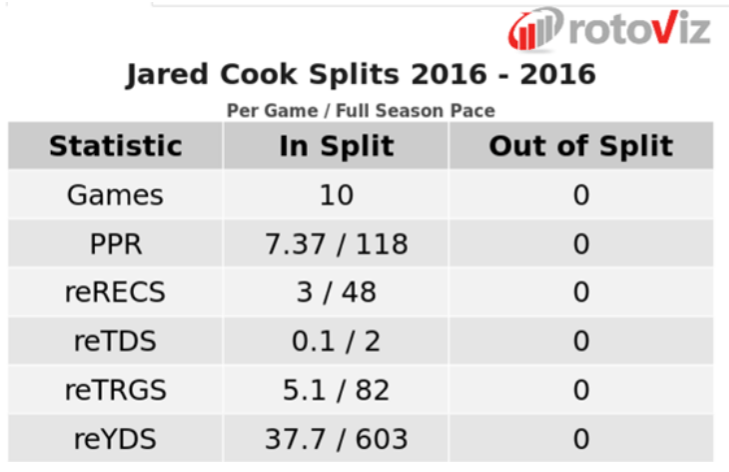 Admittedly this is a small sample size, but looking back to 2016 and 2015 there is a remarkably similar TE profile for receptions, targets, and yards per game for Jared Cook and Richard Rodgers. It seems that Rodgers isn’t honing in on the TE position. Is it simply because Rodgers hasn’t had an elite option at the position? Even if that is the case, can Graham be considered one of the league’s elite tight ends anymore? Last season, Graham was a red zone weapon for the Seahawks grabbing 10 TDs (on 92 targets). This was 2 more than Rob Gronkowski, Travis Kelce, and Zach Ertz were able to score. That’s where the good news ends. He posted his lowest number of receptions (57) outside of his rookie season, and his injury-shortened first season in Seattle. He also posted his lowest season totals in receiving yards (520) and yards after the catch (185) outside of his rookie season. Finally, Graham registered career lows in yards per catch (9.1), catch rate (59%), and average depth of target (7.9). Whether Graham will be a success in Green Bay is dependant on two key variables; his usage and ability. 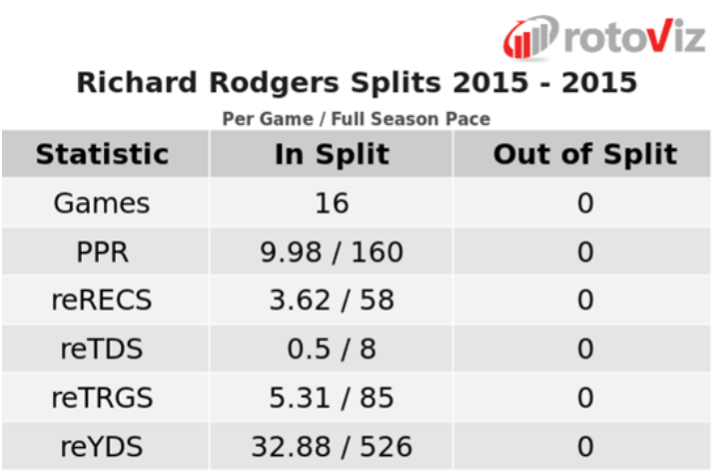 Historically, Rodgers has not heavily targeted the TE position. For Graham to produce as a top-tier fantasy asset, Rodgers will have to make a significant change in his target distribution. We can only speculate as to the reasons for lack of TE productivity in Green Bay, but the best case scenario for Jimmy Graham is that the Packers have lacked quality at the position. Even if that is the case, and Rodgers suddenly changes his proven approach to accommodate the new signing, questions remain about Graham, and whether he can still perform at an elite level. Graham’s statistical decline may simply have been tied to Seattle’s offensive struggles (ranked 14th by Football Outsiders), but given the track record of football players who suffer a patellar tendon injury, there is every chance he’s on the decline. Graham is the TE7 and 86 overall in DFF’s February ADP. Hunter Henry comes off the board immediately after Graham as the TE8 and 87 overall. It’s not a stretch to imagine that Graham’s value gets a boost following this move, which would present an excellent selling opportunity – especially to a team in win-now mode. It doesn’t take a great salesman to wax poetically about Graham’s potential upside in an Aaron Rodgers led offense. If you want to move off Graham, there are multiple pivot options to one of the younger TEs in a similar ADP range such as David Njoku (114), or Henry. O.J. Howard (76) is an intriguing option, assuming his owners are panicking following Cameron Brate’s contract extension. It’s entirely within the range of outcomes that Graham finishes as a top 5 TE in 2018, but that is more than likely dependent on touchdown output rather than volume. Graham will at best be third in targets on the team, behind Davante Adams and Randall Cobb. Realistically Graham could see fewer targets than Ty Montgomery. The Packers may also add to the wide receiver room in the draft. Given the volatility of touchdowns, combined with Rodgers’ historical lack of TE productivity, the much safer option is to move off Graham while you still can. This move has opened up perhaps the last sell-high opportunity for one of the best TEs to play in the NFL over the past 10 years. Time to jump ship.